Yesterday afternoon, Apple released the iOS 4.3.5 software update for the iPhone, iPad, and iPod touch. 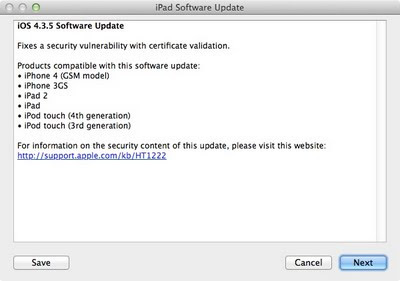 The software update addresses an issue with how security certificates are validated and does not add any new features. 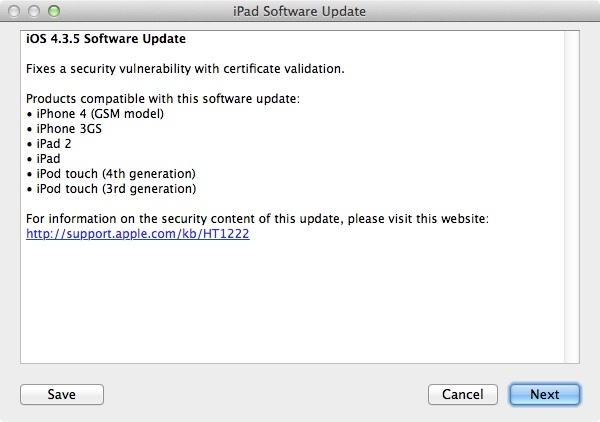 The software update is for the GSM iPhone 4, the GSM iPhone 3GS, both editions of the iPad, and the 3rd and 4th generation iPod touch. The CDMA iPhone 4 for Verizon updates to iOS 4.2.10, addressing the same problem. The latest software updates are available now via iTunes when you connect your iDevice to sync it.